Last Christmas the example of a friend motivated me to get organized for the arrival of our family. Read part one here. The 8 days our house was full of people went fabulously. I had time to sit and hold the baby, visit with my daughter-in-law, play the complicated board games my family prefers (one game took well over 2 hours), go on outings for “light-seeing” and coffee, and bring 10 people home for dinner! My sister-in-law had to sleep on a bed we pumped up every night in the family room which is right off the kitchen in our house. We draped curtains over the opening and she said she was staying in the “Taj Mahal”. We had my parents-in-law over several times as well as a couple of movie viewing nights with friends. I guess we should now call our family room “The Taj Theater” as that is where we “show” our movies. We included a stop to visit my 90 year old friend, Marion, on Christmas Eve and sing carols with her for an hour at the retirement home where she lives. We left there and went straight to the Christmas Eve service and were home and eating supper by 6:30! Below is the menu I made up. In italics are the comments I wrote down during the week and after to remember for this year. Christmas Dinner – Turkey, stuffing, gravy, mashed potatoes, Waldorf salad, (brown and serve rolls) – (family brought rest of the meal) 12 lb turkey is too small. Pay more for a bigger one! Didn’t have rolls, no complaints on that. Evening – snacks – Ate at 3:30, so didn’t really need snacks. Dinner – Spaghetti and Spicy Meatballs (freezer), salad – everyone loves the spicy meatballs! Need at least 4 per person, 5 would be better. Breakfast – cereal – Thankgiving French Toast – the make-the-night-before breakfast dishes are great, I get to do my exercises before breakfast! Lunch – Garlic Chicken Vegetable Soup – Daniel and Abby went to Grandma and Grandpa’s for lunch, we ate leftovers. Tender Chuck Roast, Mashed potatoes, green beans w/almonds, carrot salad, angel food cake, - this chuck recipe is very good, but roast needs to warm to room temp. before placing in oven, or it doesn’t get done! Dinner – honey curried chicken, rice, stir fried broccoli with peppers – did rice in oven with chicken—worked great; cover chicken with foil to keep moist. Dinner – stuffed shells, salad – Grandma and Grandpa took us out to Bishops for last time, it closes Sunday. My goal with all this menu information was to give you some inspiration and ideas. I hope it did, and I'm wishing you a wonderful and organized holiday season! 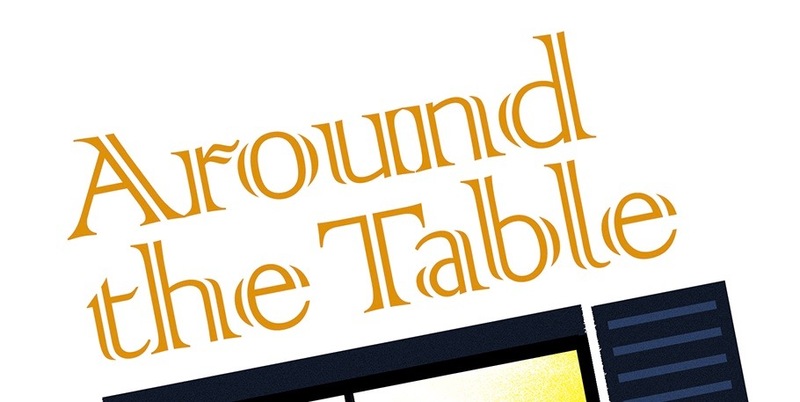 If you want a question to get the conversation going around your table like the Around the Table Book Facebook page and a question will appear on your wall everyday. This is so nice and brings back memories to me.Christmas season is one of the times I miss my family a lot. I have a very big family and we always dine together on Christmas day. But since I'm far away from home, I still do it with friends who are like family to me. Nekky, I'm so glad you get together with friends when you can't be with family. My parents always lived at least 1000 miles from extended family and for 24 years we lived on another continent so we looked for as many as we could to fill our table at Christmas every year. It's a great way to serve others and add to our own joy! Right now I have all my kids close, but that will change soon as they are marrying and moving on, so I'm grateful for every time we can get together. Looks like you did a great job of enjoying the holidays. Your meal planning was wise and it looks like your family had a great time. It's always a challenge to enjoy instead of stress. Gail, I'm feeling like this Christmas is coming up very quickly and wondering if I can be as organized, or at least organized enough to enjoy it all! Hope so! Everything sounds and looks so delicious! I'm really glad I don't have to feed that many people! But I am inspired by your organizational skills! Pretty darned amazing. I hope this year goes as well! I hope so too. I'll have quite a few more house guests and another baby for a longer time! I'm so glad they all pitch in! I still think this is such a great idea! Thanks for having the linkup! I'm a little late, but visiting from the Raising Imperfection hop. Glad you came by. I'm hoping to get this year organized, but I've had a lot of other things going on, so I'm not there yet! Enjoyed seeing your pictures and reading your menus. I'm a planner. When we go to my mother's for any occasion she has every meal written out, which dishes, tablecloth and napkins, down to how many high chairs is needed. It sure makes for a smooth celebration. Pamela, Your mom wins the prize! I look in the cupboard to see which dishes are clean and which tablecloths are clean. I start the week with all of them clean, but on we go! It does help to have things planned, though! Wow...check out that menu! That's impressive.